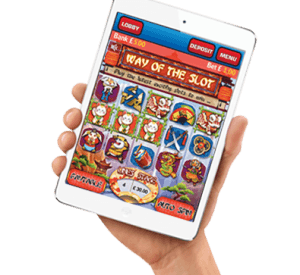 For great playing mobile slot games you needn’t look anywhere else other than casinos using the Microgaming or Playtech mobile platforms. These two platform providers offer a large range of the most popular slot games, which have endured the test of time. The main reasons why more and more slot players are sticking to playing at mobile casino sites offering the range of slot games from these two companies, is that they are popular well known online slot games, which have been enhanced to work on mobile phones and tablet type devices. As you are about to discover you will find virtually every category of mobile slot game you are looking to play on your mobile phone. Just keep on reading to find out what both Playtech mobile slots and Microgaming slots have to offer. Double Magic Slot – Will you be seeing Stars on this single payline, fast action classic Mobile slot? Boasting 800 and 1600 coin jackpots, Double Magic may just have you seeing double. Agent Jane Blond Slot – You will be helping Jane save the world on this 10,000 coin jackpot video slot, boasting 9 paylines, free spins and much, much more. This classic, 5 line video slot could see you laughing all the way to the bank. With 5 jackpots of up to 2400 coins and Wild multipliers, Mobile gaming has never been so exciting. Ladies Nite Slot – For those of you that just want to have fun will find a perfect match in Ladies Nite. Offering Free Spins, Wild symbols and a 10,000 coin jackpot spread over 9 paylines. Get yourself a Long Island Tea, and give this Mobile video slot a whirl. Spring Break Slot – British Summer got you down? Then head over to Spring Break, boasting a party theme, 15 free spins, Wild symbols and a 10,000 coin jackpot. This could just provide that little slice of summer until the real one comes! Tally Ho Slot – Don’t forget your favourite Top Hat for this one! Tally Ho offers 9 paylines, and offers a humorous poke at the British Pomp from days gone by. With 10 free spins and a 6000 coin jackpot up for grabs, you may find yourself with Afternoon Tea at the Ritz. Bar Bar Black Sheep Slot – This Classic, instant action slot is perfect for anyone looking to break into the Mobile Slots playing market. With 3 coin dependant jackpots and a clear interface, you’ll be able to spot the big wins coming. Cash Crazy Slot – Here’s another slot for those of you looking for instant action. Cash crazy comes with variable coin values and a single win line. There are also wild multipliers, and if placing a top bet, 1600 coins are up for grabs. Couch Potato Slot – Looking for more excitement for your buck? Couch Potato comes with 3 reels and one win line and offers players the chance to scoop up to 15,000 coins from any one spin. Jackpot Express – It’s not often that you can say that your commute to work was enjoyable, but Jackpot Express could just change that. With 5 win lines, wilds and a 5000 coin jackpot, Jackpot Express could turn you commute into a pleasant experience. Deck the Halls Slot – If you want it to be Christmas every day, make sure you take a look at Deck the Halls. With 30 win lines, free spins, stacked wilds and much, much more, you’ll be hoping to be on Santa’s good list! 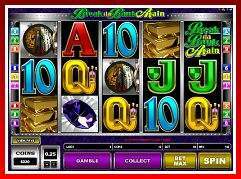 Loaded Slot – If you like the more diverse slots then look no further. Loaded comes with 25 win lines, Wild’s, Scatters, Free spins and a generous 7000 coin jackpot. Play MicroGaming’s Mobile Slots – Click Here! Rocky Slot – Try not to shout out ‘Adrian!’ when playing this! Boasting 25 paylines, free games, a bonus round and 10,000 coin jackpot. This is a must play slot for any Rocky fans out there. Safari Heat Slot – Take a step into the wild and you could be in with a chance of netting 10,000 coins. Offering 15 paylines, free spins, scatters and wilds, Safari Heat could well prove to be a profitable expedition. Santa Surprise Slot – In the festive spirit even though it’s only June? Take a look at Santa Surprise. With its offer of 15 win lines, Free Spins, a Bonus and a 10,000 coin jackpot, Christmas may just come early this year! Desert Treasure Slot – What adventures await you in the desert? With 20 win lines, a bonus round, free spins, Wild symbols and a 10,000 coin jackpot, this slot is definitely worth some playtime if you are out and about. Frankie Dettori’s Magnificent 7 Slot – If you’re a fan of the races, then the Housewives favourite has pulled it out of the bag. Offering a magnificent 7777 coin jackpot, free games, wilds and a bonus, a day at the races is only a tap away. Captain’s Treasure Slot – 9 paylines, Scatters, Free Spins and a 5000 coin jackpot await ye landlubbers on Captain’s Treasure. Will you be able find the loot on this highly detailed Mobile slot? Play PlayTech Mobile Slots Now – Click Here!